According to Henry Jenkins, author of the article Transmedia Storytelling 101, Transmedia Storytelling is the ability for a story to be told over a variety of platforms whether it be graphic novels, video game adaptations, blog series, or any other forms that can reach a social audience. Ridley Scott’s film Prometheus is a prime example of this transmedia storytelling with its different platforms that allow the audience to be sucked into the world the film has created. Jenkins goes on to state that “transmedia stories are based not on individual characters or specific plots but rather complex fictional worlds which can sustain multiple interrelated characters and their stories. In the case of Prometheus, the film used the ever so popular TED Talks Conference concept (Technology, Entertainment and Design) to help with the storyline of Prometheus and the individuals involved. However, this TED Talk was from the year 2023, which helped drive science fiction fans crazy. The presentation was by Guy Pearce’s character, Peter Weyland, founder of the Weyland Corporation who is financing the voyage they are about to embark on. The talk goes on about android technology and how man is now considered gods. This talk became one of the highlights of the conference and created a stir in the fan base. Fans at the WonderCon conference also received Weyland Corporation business cards from “actual” Weyland employees that led to another piece of in-story content that helped further the world of Prometheus. This simple piece of card stock helped allow audiences to become in contact with the android known as David, played by Michael Fassbender. This was a huge driver for the film because it showed the capability of the Weyland Corporation and just how much of a force they are to be reckoned with. This film had a lot of clues that needed the audience to go searching for and engaging in the hunt to find information about the film. 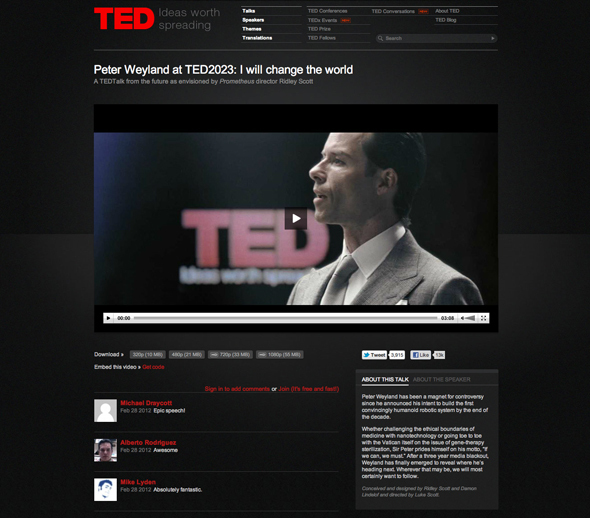 The TED Talk led its audience to the Weyland website where audiences could actually get a background of the company and view lists of company investors. The contact information was also integrated into the story. 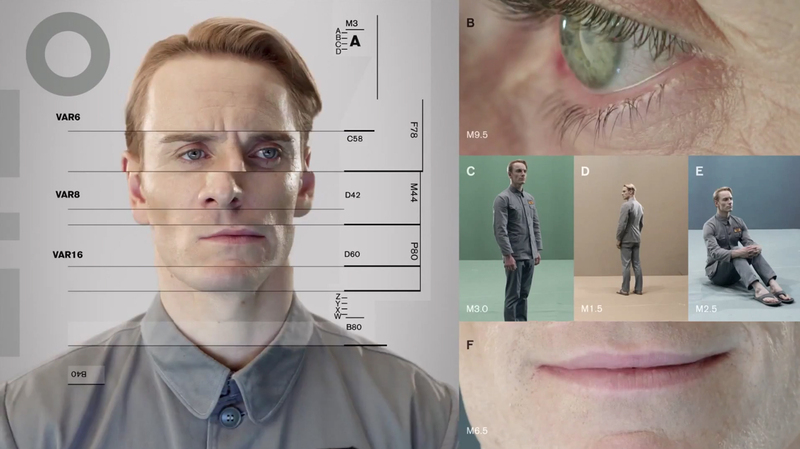 Audiences could call the contact information and receive text messages that led them to the David 8 video mentioned above. The path that Prometheus has taken greatly furthers Jenkin’s concept of Transmedia Storytelling. Jenkins states that “Transmedia storytelling practices may expand the potential market for a property by creating different points of entry for different audience segments.” The ability to allow fans and audiences the ability to gather information from various portals allows them to get an overall feel for the “world” of the content and allows them to submerge into the content, allowing them to create a unique experience for their own benefit. I have posted various links to these videos and the Weyland website. 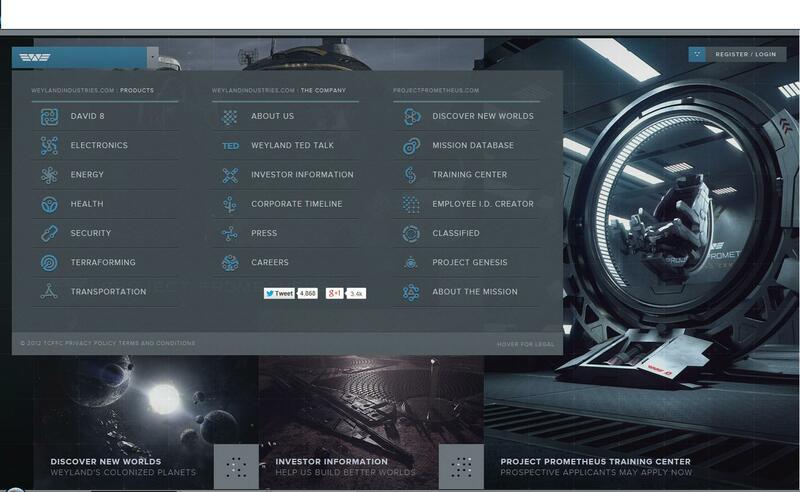 Even if you have already seen the film, the website is a great way to further your information of the world of Prometheus. I chose to do this post on the post-alternative rock band known as Breaking Benjamin. They have been my favorite band since I heard their first album Saturate. They made their debut in 1998 but have gone through a variation of different performers in their first few years. Their page wasn’t created until 2005, allowing seven years of information to get bottled up, and is currently being updated to this date. There are a total number of 6,399 edits on this page with about 8 recent “distinct authors” if that’s what you want to call them. It was quite peculiar when I went through a list of the recent edits that were made on the page. Many of the 6,399 edits were between users who were pretty much just undoing what the other had just posted. It almost creates a worry for the user regarding whether or not to trust the page with so many edits being corrected back and forth. The page will probably change while the user is on it trying to get information. If he refreshes his page about that topic, he’s going to have to change some of his information to consider it accurate. Henry Jenkins, author of the article “What Wikipedia Can Teach Us About New Media Studies”, describes this particular website as a perfect example of Collective Intelligence. The article seems to have a decent amount of information about Breaking Benjamin’s discography and progress over the years but has merely 2 sentences about what musical style they are. Henry Jenkins continues by stating “What holds a knowledge community together is not the possession of knowledge — which can be relatively static — but the social process of acquiring knowledge […] The Wikipedians bond by working together to fill gaps in their collective knowledge.” This is what allows the information to be considered collective intelligence. Various authors assisting in filling in the blanks that other editors have either overlooked or missed. This is also why Jenkins mentions how different people can feel so opposite about their edits on various pages. Jenkins states that “They are encouraged to take an inventory of what they know and what they can contribute […] On the other hand, participants are encouraged to see themselves as members of a knowledge community and to trust their collaborators to fill in information they don’t know and challenge their claims about the world.” Jenkin’s description of a sand castle being like the Wikipedia page also helped give me an idea of just what collective intelligence was, which is essentially allowing other people who you don’t know to help with the castle or the “collection of intelligence” without any prior credibility. This page was a great example of collective intelligence on the music portion of the page and is hugely popular, as one can see by being viewed almost 50,000 times in as little as a month, but doesn’t allow much room for opinion, except if you’re posting your particular interpretations of the lyrics or band decisions. Jenkins, Henry. “WHAT WIKIPEDIA CAN TEACH US ABOUT THE NEW MEDIA LITERACIES (Part two)”. Web log post. Confessions of an AcaFan. N.p., 27 June 2007. Web. 13 February 2014.